Phi Phi Hin Daeng is one of Thailand's most extraordinary dive sites. Just 45 minutes from Phi Phi Island by speedboat, Hin Daeng brings you some of the most dramatic advanced diving in open water. 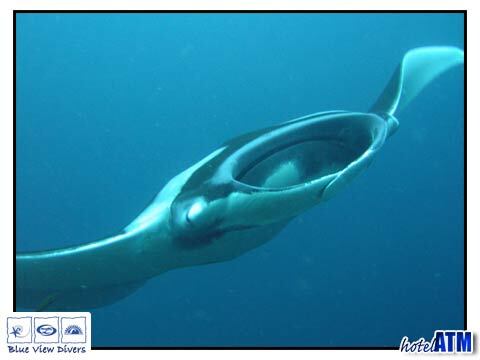 This is one of the best dive sites to catch a glimpse of the large pelagic species like the Whale Shark and Manta Ray. As you load up on to the speedboat on Tonsai beach Phi Phi Hin Daeng seems a long way away. In contrast to the Phi Phi Don and Phi Phi Ley cliffs which are imposing and very visible, the Hin Daeng dive site is the 'invisible' over the horizon. It takes a a full 45 minutes of full throttle to take you 60km south of Phi Phi and the Koh Bida dive sites, south further than Koh Ha to this remote dive site. You are as far south as Koh Rok Nok and much further you are coming into Malaysian waters. Phi Phi Hin Daeng is part of the greater Andaman Sea which is part of the Indian Ocean and is on the west coast of Thailand. Everything found in the Andaman Sea can be seen in the waters at Hin Daeng. 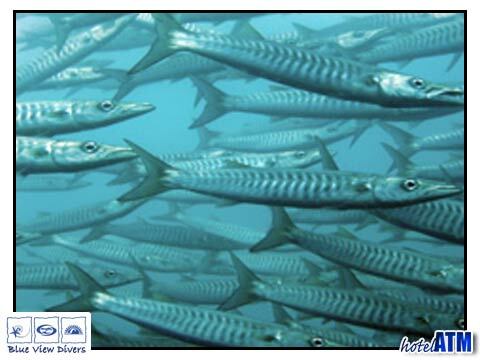 It really is an abundant eco-system replete with the largest pelagic species to the minutiae of reef life. The booking process for a dive trip to Phi Phi Hin Daeng is fairly fluid in that you can book it early or wait until you arrive and hope to get on a tour that's already going. The advantage of the former is that you secure your place, of the latter, you can judge the weather for the best conditions. However the dive schools are fairly flexible. They often allow a booking window of a few days. The diving at Phi Phi Hin Daeng is not for the beginner as it reaches 60 meters on one side. Good depth control is essential for safe diving and advanced diving experience will need to be proved on shore before departure. Diving rarely goes beyond 30 meters on Phi Phi and most of the time it is aiming for between 22-25 m on the first dive to optimize available surface time and the following dive. The dive site of Phi Phi Hin Daeng is situated on a shelf so that on one side it is 30 meters deep and on the drop off it is 60m as mentioned. Along with Hin Muang, the other dive site 350m away, these sites make for a very entertaining dive day. Of the large pelagic spicees, the Manta Ray and Whale Shark are the most famous but various ocean and sea shark make for great excitement. The range of mid-tier predators like the Red, Yellow, White Snappers and Barracuda school, hunt and survive but make way for the larger 2-3 m grey reef, black tip shark and even bull shark. Other species to look out for are the Long Nose Hawk Fish, Mantis Shrimps and Cuttlefish, Dendronephthya Crabs and in deeper waters Black Coral Shrimps Titan Trigger Fish Moray Eels. There is a resident juvenile Nurse Sharks that can be seen at 10 meters in a small cave on the southwest wall. There are also the ubiquitous Leopard Shark that seem to chase and dodge each other around the pinnacles all day long. No dive day to Phi Phi Hin Daeng is complete without a trip over to Hin Muang. Hin Muang the 'purple rock' is so named because of the extensive covering of purple soft corals. There is a lot of the same species to be seen as at Hin Daeng but it doesn’t have the drop offs so there are less of the larger pelagic activity.